Cinnamon is one of the most popular herbs for flavoring and medicinal uses. Although cinnamon oil has numerous health benefits, it often causes irritations and allergic reactions. Therefore people prefer to use cinnamon directly instead of using the oil. This article, therefore, provides the health benefits of cinnamon. 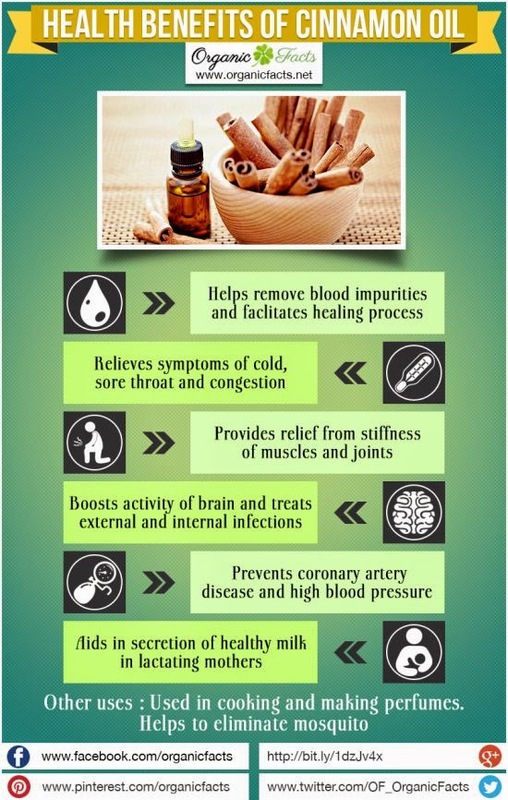 The general benefits of cinnamon oil are given below. Cinnamon, which has the scientific name Cinnamomum zeylanicum, originated in tropical Asia, and was particularly widely used in Sri Lanka and India. Now, the shrub is grown in almost every tropical region of the world. The herb, owing to its vast medicinal uses, has found a prominent position in traditional medicines, especially in Ayurveda, which is the traditional Indian medicinal system. Traditionally, cinnamon has been used in many cultures for treating a variety of health disorders including diarrhea, arthritis, menstrual cramps, heavy menstruation, yeast infections, colds, flu, and digestive problems. Cinnamon is now being used all over the world for the treatment of a variety of health disorders including respiratory problems, skin infections, blood impurity, menstrual problems, and various heart disorders. The most important part of cinnamon is its bark, which can be used in a variety of ways. The health benefits of cinnamon can be attributed to its antibacterial, antifungal, antimicrobial, astringent and anticlotting properties. Cinnamon is rich in essential minerals such as manganese, iron and calcium, while also having a high content of fiber. Brain Function: Cinnamon boosts the activity of the brain and makes it a good brain tonic. It helps to remove nervous tension and memory loss. Research at the Wheeling Jesuit University in the United States has proved that the scent of cinnamon has the ability to boost brain activity. The team of researchers, led by Dr. P. Zoladz, found that people who were given cinnamon improved their scores on cognitive activities such as attention span, virtual recognition memory, working memory, and visual-motor response speed. Blood purification: Cinnamon can also help to remove blood impurities. This also makes it a great treatment for pimples. Blood circulation: Cinnamon helps to improve the circulation of blood due to the presence of a blood thinning compound within cinnamon. This blood circulation helps to significantly reduce pain. Good blood circulation also ensures oxygen supply to the body’s cells, which leads to higher metabolic activity. You can significantly reduce the chance of suffering from a heart attack by regularly consuming cinnamon. Pain Relief: Cinnamon is also an anti-inflammatory substance, so it helps in removing stiffness of the muscles and joints. Cinnamon is also recommended for arthritis, and it is known to help in removing headaches that are caused by colds. Diabetes: Cinnamon has the ability to control blood sugar, so diabetics find it very useful because cinnamon aids them in using less insulin. Research has shown that it is particularly helpful for patients suffering from type 2 diabetes. Type 2 diabetes patients are not able to regulate their insulin levels properly. Researchers at the US Department of Agriculture’s Human Nutrition Research Center in Beltsville, Maryland studied the effect of various food substances that include cinnamon on blood sugar levels. They found that a water-soluble polyphenol compound called MHCP, which is abundant in cinnamon, synergistically acted with insulin and helped in the better utilization of that vital component of human health. Infections: Due to its anti-fungal, antibacterial, antiviral and antiseptic properties, it is effective on treating external as well as internal infections. It helps in destroying germs in the gall bladder and the bacteria present in staph infections. Healing: Cinnamon acts as a coagulant and helps to stop excess bleeding. Therefore, it facilitates the healing process. Heart diseases: It is believed that the calcium and fiber present in cinnamon provide protection against heart diseases. By including a little cinnamon in your food, you can help prevent coronary artery disease and high blood pressure. Colon cancer: It can also improves the health of the colon and thereby reduce the risk of colon cancer. 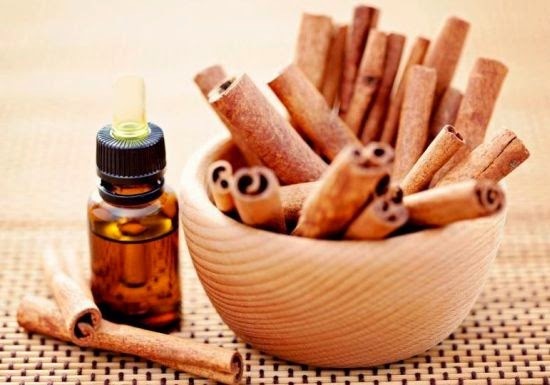 Mouth freshener: Cinnamon is often used in chewing gums, as it is a good mouth freshener and removes bad breath. Perfumes: It has a refreshing aroma and is extensively used in perfume-making. Indigestion: Cinnamon is added in many ethnic recipes. Apart from adding flavor to the food, it also aids in digestion. Cinnamon is very effective for indigestion, nausea, vomiting, upset stomach, diarrhea and flatulence. Due to its carminative properties, it is very helpful in eliminating excess gas from the stomach and intestines. It also removes acidity, combats diarrhea and reduces the effects of morning sickness. Cinnamon is therefore often referred to as a digestive tonic. Respiratory problems: Cinnamon helps in relieving the symptoms of colds, influenza, sore throat and congestion. Menstruation: Cinnamon is effective in providing relief from menstrual discomfort and cramping. Birth control: Cinnamon also helps in natural birth control. Regular consumption of cinnamon after child birth delays menstruation and thus helps to avoid conception. Breastfeeding: It is also believed that cinnamon aids in the secretion of healthy breast milk. Cinnamon is diuretic in nature and helps in the secretion and discharge of urine. It is also commonly used as an aphrodisiac and is believed to arouse sexual desire in men and women. Cinnamon oil is obtained from the bark and leaves of cinnamon trees. Cinnamon oil does have various applications in aromatherapy; however, it is not as popular as other essential oils such as pine essential oil, basil essential oil, rosemary essential oil and lavender essential oil. Cooking: Some people add cinnamon oil while they are cooking. Cinnamon oil obtained from the leaves contains a compound named cinnamaldehyde, which is an excellent flavoring agent. Room freshener: The pleasant aroma of cinnamon oil makes it a very effective as a room freshener. It is often added to potpourris. Eliminating mosquitoes: Cinnamon oil is a great mosquito repellent. Research has now proved that cinnamon oil is very effective in killing mosquito larvae. The Journal of Agricultural and Food Chemistry (a renowned scientific journal) has reported on that research, which had been conducted at the National Taiwan University. Apart from the leaves of cinnamon, its bark is also a good source of cinnamaldehyde, which is an active mosquito killing agent. This research has paved the way for finding an environmentally safe solution for solving the global menace and disease-spreading capacity of mosquitoes. Many companies that produce cinnamon oil claim that it is a good antibacterial and antifungal agent, making it very effective in the treatment of infections. It also helps increase blood circulation and acts as a sexual stimulant. Research has also proven that cinnamon oil obtained from the leaves and twigs of cinnamon can be used for controlling mites that negatively affect honey bees. Being strong in nature, cinnamon oil should be avoided for internal consumption. Furthermore, it can have adverse effects on the skin if used topically in concentrated form. Therefore, it should be used in diluted form. Before using cinnamon oil, it should be tested to make sure that it suits your skin. You should apply only a small quantity of cinnamon oil initially and check if you develop any allergic reaction symptoms. Do not apply cinnamon oil on the face and other sensitive areas. Cinnamon blends well with various essential oils, so it is added to many aromatherapy preparations. It enhances the effectiveness of other herbs and essential oils, thus speeding up the treatment of various herbal remedies. Furthermore, many herbs can have an unpleasant taste. Cinnamon or cinnamon oil is often added to herbal preparations to make them taste better. The oil blends well with other essential oils such as lemon essential oil, rosemary essential oil, geranium essential oil, lavender essential oil and cardamom essential oil.